• A greater emphasis on tempeh and miso than tofu, which we now see as more beneficial than we once thought. So, you’ll find old friends here and hopefully discover some new ones. And, as in the older version, if you’re vegetarian, you can eat everything in this book. If you’re vegan, you can eat from a great many recipes or make the changes you’re accustomed to. And if you are an omnivore, there’s nothing that says these recipes can’t be served with meat or made with meat-based stocks. The choice is entirely yours. 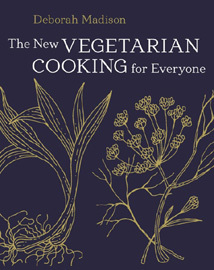 Whatever your personal approach, I hope very much that you enjoy The New Vegetarian Cooking for Everyone.